The Junkers Ju 49 was a German aircraft designed to investigate high-altitude flight and the techniques of cabin pressurization. It was the world's first working pressurised aircraft. 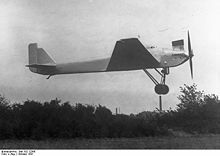 By 1935, it was flying regularly to around 12,500m (41,000ft). The Junkers Ju 49 was developed entirely to investigate techniques for flight at high altitude. To this end, it had a specially developed engine and the first pressurized cabin in a German aircraft. The engine was the Junkers L88a, which combined two six-cylinder inline L8 motors into an upright V-12 and had a two-stage supercharger plus intercooler to sustain power at high altitudes. It produced 522kW (700hp) at about 5,800m (19,000ft). This engine drove a large four-blade propeller. The pressure cabin held the two crew. The original intention was for operation at about 6,000m (20,000ft). 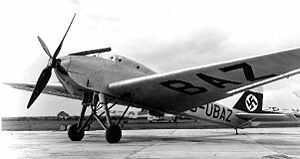 The Ju 49 was built in typical Junkers fashion as a cantilever-wing monoplane of all-metal construction with stressed duralumin skin throughout, corrugated on the flying surfaces. The wing trailing edge featured the standard Junkers "double wing", combining adjustable flap and aileron surfaces outboard, together with plain flaps inboard. The aircraft had a fixed, split-axle main undercarriage which was noticeably tall, to accommodate the large-diameter propeller, plus a tailskid. A retractable rectangular radiator descended between and just in front of the undercarriage legs. The pressurized cabin had five small portholes for the pilot, two forward, two sideways and one overhead, and there were two more, one on each side for the second crew member. The forward view was so poor that a periscope was fitted with a downward view for landing. The supercharged engine was not cleared for use at the time of the first flight on October 19 and the Ju 49 used instead the unsupercharged L88 version. Externally this installation was characterised by a tall, inline vertical stack of exhausts, unlike the single sloping pipe of the L88a. By summer 1932, the supercharged engine was flight-ready and installed, and the research program proper began. This was uneventful, with no serious engine or cabin problems. Remarkably, given the initial target altitude of around 6,000m (20,000ft), by 1933 flights at 10,000m (30,500ft) were being made and by 1935 altitudes of 12,500m (41,000ft) were routine. No absolute records were set, but the experience gained fed into later pressurized aircraft, particularly the Ju 86P bombers and reconnaissance machines. Only one Ju 49 was built, carrying the civil registration D2688 and later (when German civil registrations changed from numbers to letters) D-UBAZ. It ended its life at the German research centre (Deutsche Versuchsanstalt fur Luftfahrt) and crashed in October 1937. The late 1920s and the 1930s had seen an increased interest in the attainment of high altitudes and a stream of new absolute altitude records ensued. There were three approaches. Use oxygen via a face mask, and endure hypoxia and extreme cold. Flyers like Cyril Unwins - 13,408m (43,990ft) in a Vickers Vespa in September 1932 - and Renato Donati - 14,433m (47,385ft) in a Caproni Ca 114 in late 1933 - took this route, sitting in open cockpits. Necessarily, these were up and down flights; continuous flight at high altitudes with this approach would not have been survivable. Pressure suits: these were pioneered by Wiley Post in his Lockheed Vega 5b from September 1934 onwards. He was able ultimately to sustain flights of several hours at over 15,000m (49,000ft). Others used pressure suits to set records with up and down flights, like F.R. Swain (15,230m or 49,970ft) in the Bristol 138 in September 1936 and Mario Pezzi (17,083m or 56,047ft) in a Caproni Ca 16bis in October 1938. Post's work showed sustained high-altitude flight was possible, but pressure suits were uncomfortable and restrictive. Ultimately, the pressure cabin, insulated from the cold or heated was the way to allow crew and, eventually passengers to travel in a normal environment. As far as is known, the Ju 49 was the first aircraft to realise this approach. It is sometimes claimed that the Lockheed XC-35 was the first pressurized aircraft, but this first flew in May 1937 some years after the Junkers. The XC-35 was the first aircraft using the monocoque fuselage skin as the pressure vessel, the standard for all later pressurised aircraft. The only other claimant is the Dayton-Wright built and uniquely modified USD-9A, which flew just once in 1921. The pressure relief valve failed shortly into this flight and although the aircraft and pilot survived, the pressurised cabin research programme was abandoned. Boyne, Walter J. (2001). Best of Wings. Dulles: Brassey. ISBN1 57488 368 2. Kay, Antony L (2004). Junkers aircraft & engines. London: Putnam. ISBN0 85177 985 9. Turner, P. St. John; Nowarra, Heinz J. (1971). Junkers:an aircraft album n.3. New York: Arco Publishing. ISBN0 688 02506 9.